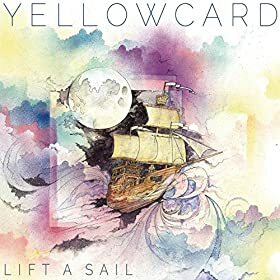 After their longtime drummer leaving the band and vocalist Ryan Key going through a lot over the past couple of years, Lift A Sail is something new from the Yellowcard that you’re used to hearing. The songwriting seems more emotional than before, seeing Key pour his heart out into songs about his wife (“One Bedroom” and “Madrid”) and the death of his grandfather (“My Mountain”). Overall, the sound is beautiful, with strong guitars and drums, and violinist Sean Mackin taking the lead on the opener (“Convocation”) and also on the song “MSK,” which features nothing but the violin, some sparse keys and electronics, and Key’s voice. “One Bedroom” is the standout of the album, a touching love song that slowly builds to an awesome guitar solo at the end. “Transmission Home” has crashing drums and strong guitars that really make the song take off, and the title track is an inspiring anthem, with lyrics stating “I am ready now,” and that the insecure emotions of the past are long gone. “MSK” gives Mackin a chance to showcase what he can do on the violin, a nice change since his talent usually seems to get a little lost behind the guitars and drums. “Illuminate” and “Crash the Gates” give you the loud guitars that you’re used to hearing from the band, but in an evolved, different way and recently released single “Make Me So” is a catchy tune that will have fans everywhere singing along with it. “The Deepest Well” features a guest vocal from Memphis May Fire vocalist, Matty Mullins. Their voices blend quite well together as their vocals exchange throughout the song. Lift A Sail does have its flaws, though. Some of the songs, “Fragile and Dear” for instance, seem to just have a bit too long of a running time, causing the tracks to feel like they’re just dragging on after awhile. Also, the overall tempo of the tracks just feels on the slow side. There are a decent amount of ballads and most of the other songs are a slower tempo as well. However, it’s still a pretty great album. It shows that seven albums into a career, Yellowcard can do something new and change their sound up, but still keep what’s kept fans coming back for this long. Lift A Sail will be released on October 7th via Razor and Tie.